“It ain’t over till the fat lady sings.” Such is grand opera, infamous in the public mind for hefty sopranos and death arias that just won’t die. We the audience are fortunate that Gounod’s Juliette shuffles off her mortal coil with comparative brevity. It’s been five—intoxicating, yes, but five—acts at this point and everybody could use a stiff drink and some silence. Gounod’s Roméo et Juliette condenses much of its Shakespeare source material for the simple reason that words take longer to sing than speak. The drama dispenses with side plots and focuses wholly on the leading couple, soprano-tenor duo Susanna Phillips and Joseph Calleja. Lyric casting has been spotty this season, but in this production the leads are spot on: Phillips and Calleja delivered consummate vocal and physical chemistry, believable and mostly without defect. Levity is essential to French opera in general and Gounod in particular. The role of Juliette, for instance, is written for coloratura soprano, a select species of the female voice characterized by agility and crystal-clear timbre. Makes sense. Juliette is a teenage girl with dreams of romance—a sparkling, acrobatic voice matches her passion and naiveté well. At the same time, orchestration assumes a more atmospheric role, yielding center stage to the singers in fleshing out characters and narratives. Consider Juliette’s famous first-act aria, “Je veux vivre dans le rêve” (“I want to live in the dream”). Support from the pit is sparse, with the merest rum-pum-pum waltz rhythm and occasional countermelody. The soprano reigns as a sort of manic songbird: she commands attention with an arsenal of trills and runs, passages both lyrical and arpeggiated. Phillips did not disappoint. Her silvery timbre floated gossamer in clear-cut runs like the sort of pure mountain spring I imagine Evian comes from; her ornaments had the coyness of lace hankies falling to the floor one by one. Onstage, Phillips possessed an easy comfort that passed character affects—a wink here, a gesture there—as natural rather than forced. Yet her money notes were consistently flat. Juliette’s stratospheric, pinging finishes came in under pitch and harrowed like Christ through the gates of Hell; at times they bit with a metallic grate that made her attempt at bravura difficult to stomach. An ardent Roméo, Calleja mirrored the vocal strengths of his leading lady. His resplendent center to mid-upper registers flowed in torrents of thick, burnished amber. “Ah! lève-toi, soleil!” (“Ah! rise, sun!”), the opera’s “what light through yonder window breaks” moment, stunned with the warm glow of Calleja’s tenor. His command of character redoubled the force of his stage presence, best exemplified by his vigorous energy in the Act III fight scenes. Kudos to Calleja and fight director B. H. Barry for wholly watchable swordplay. But his high notes were again problematic, their accuracy and resonance undercut by a persistent, jarring rattle from the throat. Pair them with Phillips’s off-center pitches and Gounod’s lush duet outros become rather unbearable to hear. This is not to discount the remarkable vocal and physical chemistry between Phillips and Calleja throughout the opera. Love duets fly thick and fast in Roméo et Juliette, from the sensual to the cemetery to every shade in between. In their vocal Goldilocks zone, Phillips and Calleja melded bright soprano and unctuous tenor to sublime lyrical effect—to the ear, Gounod’s close-tied melodies became rays of light dancing through tongues of fire. Moreover, they held each other with such tenderness and ecstasy and desperation that eyes corroborated what ears heard. Don’t bet on those tops, though. A strong supporting cast left little else to be desired. Marianne Crebassa excelled in particular as the pageboy Stéphano, whose charming “Que fais-tu, blanche tourterelle” (“What do you do, white dove”) showcased spunky characterization and a mellow, remarkably secure soprano. Her ornaments impressed with solid technique—and a dash of cheek for good measure. Philip Horst’s robust bass lent gravitas to Count Capulet. His anguish at Tybalt’s death was especially memorable, tinting his voice charcoal-dark for arresting emotional effect. 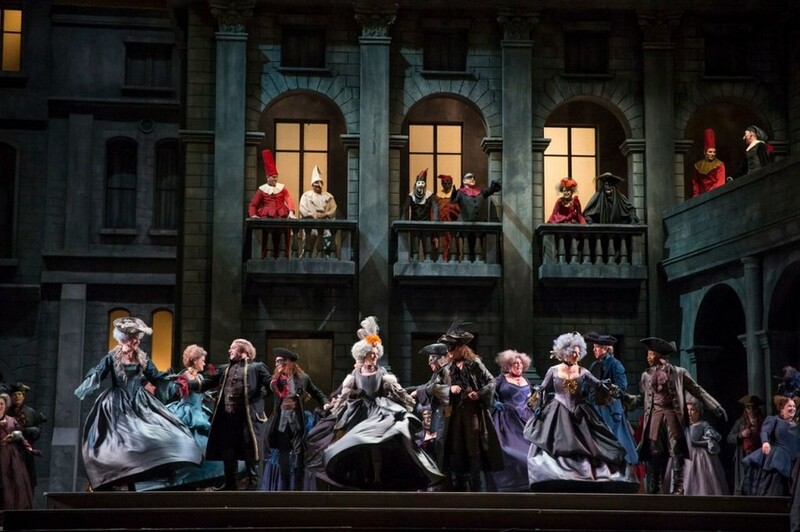 Best known for his contributions to Broadway, director Bartlett Sher struck a comfortable balance between veristic and theatrical in his vision of Roméo et Juliette, on loan from the Metropolitan Opera. Monolithic and sparsely accompanied, the opening chorus—think “two households, both alike in etc.” but French—becomes even more foreboding thanks to Sher’s pantomime en masse. Even more powerful was his use of a white sheet that covered center stage as thematic continuity between acts four and five. The cloth becomes in sequence bedsheet (during the lovers’ rendezvous), bridal veil (at Juliette’s wedding to Paris), and burial shroud (when the poison takes effect): it gives physical form to the twin motifs of love and death, doing so with great power. Certain costuming decisions, however, resulted in a general aesthetic best described as Tim Burton does Les Mis—which we may generously deem unfortunate. If Roméo et Juliette is any indication of what Lyric can do with grand opéra, the public may wait for Berlioz’s marathon Les Troyens next season with reasonable excitement.